Posted on August 26, 2011 by Christian N.
This is article was first published as a guest post on Search Engine Journal , August 10, 2011. Tools are essential in search engine marketing. They save us time, teach us about our market, help us grow our campaigns and make our job easier. Sometimes, they make the difference between a good search engine marketer and a great one. Here are 3 absolutely free adwords tools that are rarely talked about but can deliver very useful insights for your paid search efforts. The first on our list wasn’t destined to be used with AdWords. What’s cool about it? Enter your keywords and it will show you a great variety of competitive metrics about your market you would have never found otherwise. For example, you can enter an entire keyword list and learn what the average CTR is for each keyword on Bing. Which means that you can pick and choose only high CTR keywords and easily avoid those that would yield low CTR before you ever advertise for them. This is extremely important for containing your Adwords costs because CTR is the main factor that influences quality scores which in turn influences costs. That was just one example of how to use the AdCenter tool. Other ways include getting keyword suggestions based on what other advertisers are bidding on or getting the exact search traffic of a keyword by day. Even though this is data from Bing, you can assume that gap differences between one keyword to the other is the same on Google and make decisions based on that. The cons? 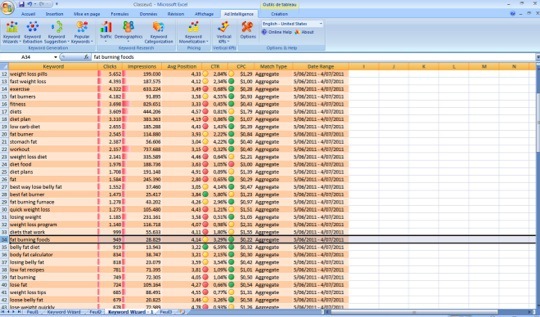 It’s an excel addon. Which means you have to be on windows and you have to download stuff that often bugs. I say that because downloading and installing the addon came with a lot of hassle. It didn’t work on my first try but the persistence was worth it. This tool has gone under the radar, so did the video that inspired it. What’s cool about it? 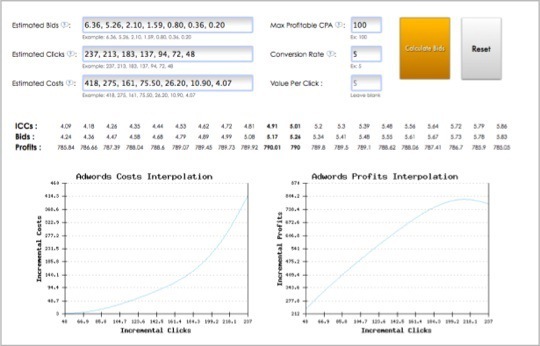 Enter the predicted bids/clicks/costs by the adwords bid simulator then enter a few of your business metrics, it will tell you what you need to bid for maximum profitability. It uses a methodology that was first introduced by Hal Varian, Google Chief Economist, and makes it simpler to implement. Make sure to watch the video on the page first to understand what incremental cost-per-click is and grasp the optimization concept. The cons? It has to be used in conjunction with the Adwords bid simulator which doesn’t always provide accurate predictions. That’s why it’s always better to take the results with a grain of salt and test them before adopting them. The methodology can also be a little hard to understand but you’ll be glad you took the time to learn it. What’s cool about Jumbo? It brings a myriad of editing functionalities into one simple interface. Every time you need to remove duplicates from a list of keywords, change them into domain names and vice versa or group them into identical terms, Jumbo comes to the rescue. The cons? I recently wanted to turn my keywords into modified broad matches and didn’t find a way to do it in Jumbo as I expected. It has a lot of simple functionalities but you’ll often feel like there’s something missing. It’s still worth keeping it in your tool set. If you know of any other useful and 100% free tool that isn’t talked about much in our community, feel free to share in the comments. I didn’t know about those. Thanks for sharing.